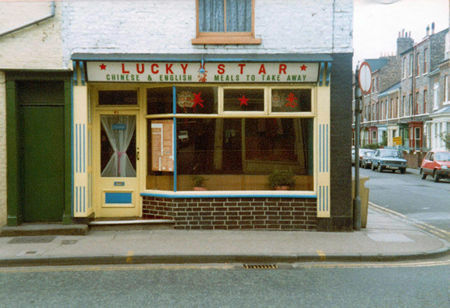 Back in the autumn I included this photo of the Lucky Star take-away on Gillygate, taken by Andy Tuckwell, back in the late 1970s. Since the photo appeared online, I’ve had an email from Alan Mak, whose family had the shop for many many years. His parents are from Guangdong in Southern China, and the story of how they came to be living and working on Gillygate in York can be read in Alan’s interview on www.betweeneastandwest.com. The photos of the interior of the Lucky Star included on that page were very familiar! I do remember visiting quite a lot in the 1980s, as a regular of the pub opposite. I think when I was a customer Alan would have been a very young boy. Leaping forward into the present – indeed running into it – Alan is one of the torchbearers carrying the 2012 torch – in Bedale, North Yorkshire, on Wednesday 20 June. I’d been finding it difficult to get excited about the Olympics being in the UK, but the torch-carrying is quite a spectacle, as I’ve appreciated today. I’ve been watching the online live coverage of the torch going through Pickering, carried by, among others, Alison Bates, accompanied by her guide dog. It’s very inspiring seeing that flame passed on from hand to hand, on its way to London (via York, tomorrow). 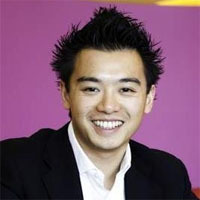 Alan Mak is carrying the torch on behalf of the charity Magic Breakfast, of which he is President and a trustee. It helps 6,000 British primary school children every morning in 210 schools, including in Yorkshire. The charity provides bagels, cereal, porridge and juice to the UK’s hungriest, poorest children aged 5-11. This essential ‘fuel for learning’, boosts the children’s concentration in class, attendance at school, and success in exams. Alan has worked tirelessly to raise public and political awareness and to raise much needed funds for the charity. He hopes that carrying the Olympic torch will also help to raise awareness. I’m sure I’m not alone in wanting to wish him well, the boy who grew up in the take-away on Gillygate, as he carries the Olympic torch in Yorkshire. If you can, be in Bedale for 11.15am on 20 June, or watch online. And after the flame has gone, perhaps visit magicbreakfast.com and support this charity which feeds hungry children, and needs funds all year round.